Michele Tantussi/GettyAngela Merkel says she’s stepping down as CDU chair but remaining Germany’s chancellor through her term. 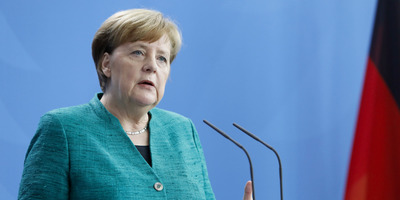 Angela Merkel on Monday said she was stepping down as the leader of Germany’s Christian Democratic Union party. She said she would stay on as Germany’s chancellor through her term, which expires in 2021, but would not run for reelection after that. The CDU has suffered numerous setbacks in regional elections. Angela Merkel is stepping down as the leader of her political party but plans to stay on as Germany’s chancellor until the end of her term. She told a closed meeting of Christian Democratic Union party leaders on Monday morning that she would not run as the party’s chair in December, Deutsche Welle and Bloomberg reported. Merkel confirmed those plans at a press conference hours later. She intends to remain chancellor until 2021, when her parliamentary term runs out, the Associated Press cited her as saying. She said she would not seek reelection as chancellor. A new CDU chair will be elected at the coming party conference in December, Deutsche Welle said. Merkel said she wanted to give the party a chance for renewal while continuing to run the country, the Associated Press said. Merkel’s party has experienced a series of losses in regional elections, most recently in the central German region of Hesse – a former CDU stronghold – on Sunday. She has been the CDU leader since 2000. The CDU won about 28% of the vote there Sunday, down from 38% five years ago. Its loss increases the instability of the CDU’s grand coalition with the Social Democratic Party, with whom the CDU rules in Berlin. Lars Klingbeil, the SPD secretary-general, said Sunday’s result was a signal “that the grand coalition can’t go on like this,” according to the Financial Times. The country’s far-right Alternative for Germany party on Sunday secured about 12% of the vote and will enter the region’s assembly for the first time. The nationalist, anti-euro party surged to third place in the country’s national election last September.